Bumblebee began his first shift at Freddy Fazbear’s. Cybertron used to be a peaceful planet, powered by the mysterious All-Spark cube and led by the fair Optimus Prime and the firm protector Megatron. 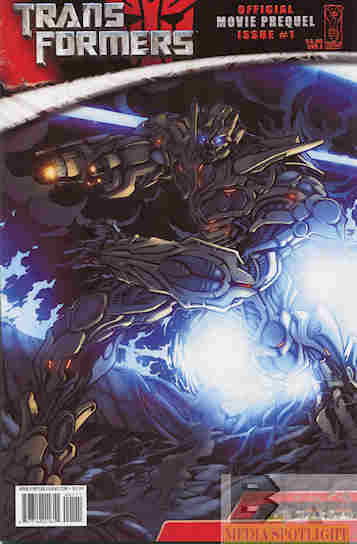 That is until Megatron went crazy and the war between Autobot and Decepticon began. Now Bumblebee’s unit is trying to delay Megatron, who seems drawn to the All-Spark, while he alone knows where the All-Spark is and that Optimus is about to launch it into outer space, away from Megatron’s corruption. He is successful, but Megatron’s space mode will allow him to pursue it, and he damages Bumblebee’s voice capacitor before he leaves. They won, but for how long? What they got right: As backstory to the Movieverse it’s well-written. We learn how Bumblebee’s voice box was damaged before the events of the movie. And it’s the first appearance of the Movieverse version of Arcee, who was intended to be in the first movie but for whatever reason didn’t debut until the second, where they gave her that unicycle leg thing. What they got wrong: Visually however it’s a bit of a mess. Figueroa doesn’t have a lot to work with mind you. The Movieverse design flaws are very apparent here, as characters have so few distinguishing characteristics that half the time you don’t know who’s talking or doing anything. The darker colors don’t help and for some reason the flashbacks are all white with black lineart. I can’t even call it “black and white” because it looks more like someone has the lights too bright. And one district is called “Simfur”, which would be a nice nod to Simon Furman (who for some reason is considered a fan favorite Transformers writer) but since one of the writers IS Simon Furman it comes off as a bit on the egotistical side. Maybe that was Ryall’s contribution but maybe save nods like that for writers who aren’t currently working on the project. Other notes: This prequel miniseries was cut down for the “animated” prequel special “Beginnings”, released as a Wal-Mart special bonus. I picked that up and someday I will review it. Recommendation: I think you’d be better off with “Beginnings” that this issue. It’s hard to recommend because half the time I’m not even sure what’s going on. Probably better to pass on it. Posted by ShadowWing Tronix on August 9, 2018 in Movie Spotlight, Yesterday's Comics and tagged IDW Publishing, Michael Bay, Transformers, Transformers (film series).